So.. At the new Gig (working for the man) there is this Drainage pool behind the parking lot. Normally, this is just a large empty grassy hole. 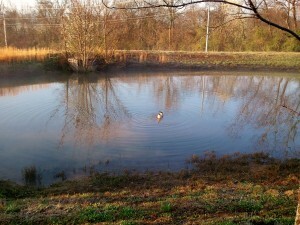 But, with all the rain we’ve had lately, this tends to fill up and turn in to a pretty respectable pond. It must be pretty good because these Ducks seem to come back every time it fills. This morning, I arrived and found these two guys back again and obviously pretty happy. But, today I was slow on the draw and the best I can do for a picture is … Some Duck butts. Boy can these guys hold their breathe a long time. If you don’t like the Duck Butts, at least the reflection off the pool is pretty cool.